This therapeutic/correction show pad has options for additional padding to lift the pommel or cantle of your saddle. 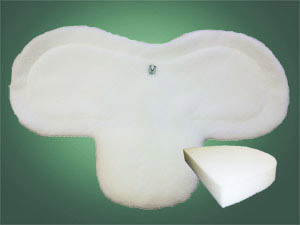 This padding can be used to make minor corrections to saddle fit. 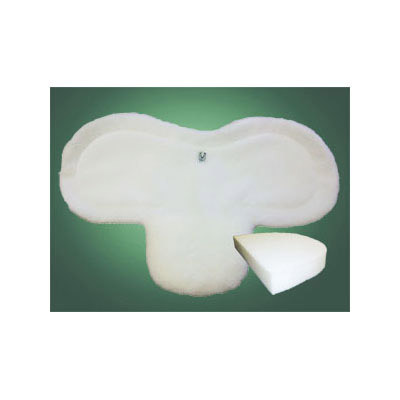 This pad should only be used if your horse and saddle require a special pad to correct the balance of your saddle. Choose from options below to construct the perfect pad to fit your needs. Features a high loft, fluffy synthetic fleece top with 100% quilted cotton flannel against the horse and cantle rider stitched securely inside the saddle. Buildup pads are notorious for slipping, but with this pad and riser combo, your correction pad will stay securely in place.